Liczba stron: 981 Jest to ujednolicona liczba stron, która ułatwi Ci porównanie długości książek. Każda strona Legimi to 200 słów. 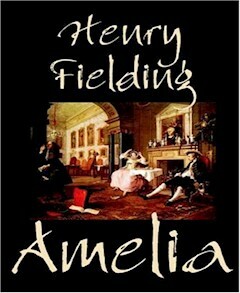 Amelia is a novel written by Henry Fielding. Amelia is a domestic novel taking place largely in London during 1733. It describes the hardships suffered by a young couple newly married. Against her mother's wishes, Amelia marries Captain William Booth, a dashing young army officer. The couple run away to London. William is unjustly imprisoned in Newgate, and is subsequently seduced by Miss Matthews. During this time, it is revealed that Amelia was in a carriage accident and that her nose was ruined. Amelia resists the attentions paid to her by several men in William's absence and stays faithful to him. She forgives his transgression, but William soon draws them into trouble again as he accrues gambling debts trying to lift the couple out of poverty. He soon finds himself in debtors' prison. Amelia then discovers that she is her mother's heiress and, the debt being settled, William is released and the couple retires to the country. On the first of April, in the year ----, the watchmen of a certain parish (I know not particularly which) within the liberty of Westminster brought several persons whom they had apprehended the preceding night before Jonathan Thrasher, Esq., one of the justices of the peace for that liberty. The first who came upon his trial was as bloody a spectre as ever the imagination of a murderer or a tragic poet conceived. This poor wretch was charged with a battery by a much stouter man than himself; indeed the accused person bore about him some evidence that he had been in an affray, his cloaths being very bloody, but certain open sluices on his own head sufficiently shewed whence all the scarlet stream had issued: whereas the accuser had not the least mark or appearance of any wound. The justice asked the defendant, What he meant by breaking the king's peace?----To which he answered----"Upon my shoul I do love the king very well, and I have not been after breaking anything of his that I do know; but upon my shoul this man hath brake my head, and my head did brake his stick; that is all, gra." He then offered to produce several witnesses against this improbable accusation; but the justice presently interrupted him, saying, "Sirrah, your tongue betrays your guilt. You are an Irishman, and that is always sufficient evidence with me." Mr. Booth (for we shall not trouble you with the rest) was no sooner arrived in the prison than a number of persons gathered round him, all demanding garnish; to which Mr. Booth not making a ready answer, as indeed he did not understand the word, some were going to lay hold of him, when a person of apparent dignity came up and insisted that no one should affront the gentleman. This person then, who was no less than the master or keeper of the prison, turning towards Mr. Booth, acquainted him that it was the custom of the place for every prisoner upon his first arrival there to give something to the former prisoners to make them drink. This, he said, was what they call garnish, and concluded with advising his new customer to draw his purse upon the present occasion. Mr. Booth answered that he would very readily comply with this laudable custom, was it in his power; but that in reality he had not a shilling in his pocket, and, what was worse, he had not a shilling in the world.--"Oho! if that be the case," cries the keeper, "it is another matter, and I have nothing to say." Upon which he immediately departed, and left poor Booth to the mercy of his companions, who without loss of time applied themselves to uncasing, as they termed it, and with such dexterity, that his coat was not only stript off, but out of sight in a minute. The first person who accosted him was called Blear-eyed Moll, a woman of no very comely appearance. Her eye (for she had but one), whence she derived her nickname, was such as that nickname bespoke; besides which, it had two remarkable qualities; for first, as if Nature had been careful to provide for her own defect, it constantly looked towards her blind side; and secondly, the ball consisted almost entirely of white, or rather yellow, with a little grey spot in the corner, so small that it was scarce discernible. Nose she had none; for Venus, envious perhaps at her former charms, had carried off the gristly part; and some earthly damsel, perhaps, from the same envy, had levelled the bone with the rest of her face: indeed it was far beneath the bones of her cheeks, which rose proportionally higher than is usual. About half a dozen ebony teeth fortified that large and long canal which nature had cut from ear to ear, at the bottom of which was a chin preposterously short, nature having turned up the bottom, instead of suffering it to grow to its due length. Blear-eyed Moll then came up to Mr. Booth with a smile, or rather grin, on her countenance, and asked him for a dram of gin; and when Booth assured her that he had not a penny of money, she replied--"D--n your eyes, I thought by your look you had been a clever fellow, and upon the snaffling lay [Footnote: A cant term for robbery on the highway] at least; but, d--n your body and eyes, I find you are some sneaking budge [Footnote: Another cant term for pilfering] rascal." She then launched forth a volley of dreadful oaths, interlarded with some language not proper to be repeated here, and was going to lay hold on poor Booth, when a tall prisoner, who had been very earnestly eying Booth for some time, came up, and, taking her by the shoulder, flung her off at some distance, cursing her for a b--h, and bidding her let the gentleman alone. labefacta cadelat Religio, causaeque--viam non sponte sequebar Alterius; vacua quae currere semina motu Affirmat; magnumque novas fer inane figures Fortuna, non arte, regi; quae numina sensu Ambiguo, vel nulla futat, vel nescia nostri. She then flung herself into her chair, where she gave a loose to her passion, whilst he, in the most affectionate and tender manner, endeavoured to soothe and comfort her; but passion itself did probably more for its own relief than all his friendly consolations. Having vented this in a large flood of tears, she became pretty well composed; but Booth unhappily mentioning her father, she again relapsed into an agony, and cried out, "Why? why will you repeat the name of that dear man? I have disgraced him, Mr. Booth, I am unworthy the name of his daughter." --Here passion again stopped her words, and discharged itself in tears. "I hope I am, madam," answered he; "for I cannot believe what I have heard in the prison--surely murder"--at which words she started from her chair, repeating, "Murder! oh! it is music in my ears!--You have heard then the cause of my commitment, my glory, my delight, my reparation! Yes, my old friend, this is the hand, this is the arm that drove the penknife to his heart. Unkind fortune, that not one drop of his blood reached my hand.--Indeed, sir, I would never have washed it from it.--But, though I have not the happiness to see it on my hand, I have the glorious satisfaction of remembering I saw it run in rivers on the floor; I saw it forsake his cheeks, I saw him fall a martyr to my revenge. And is the killing a villain to be called murder? perhaps the law calls it so.--Let it call it what it will, or punish me as it pleases.---Punish me!--no, no---that is not in the power of man--not of that monster man, Mr. Booth. I am undone, am revenged, and have now no more business for life; let them take it from me when they will." I happened in my youth to sit behind two ladies in a side-box at a play, where, in the balcony on the opposite side, was placed the inimitable B---y C---s, in company with a young fellow of no very formal, or indeed sober, appearance. One of the ladies, I remember, said to the other--"Did you ever see anything look so modest and so innocent as that girl over the way? what pity it is such a creature should be in the way of ruin, as I am afraid she is, by her being alone with that young fellow!" Now this lady was no bad physiognomist, for it was impossible to conceive a greater appearance of modesty, innocence, and simplicity, than what nature had displayed in the countenance of that girl; and yet, all appearances notwithstanding, I myself (remember, critic, it was in my youth) had a few mornings before seen that very identical picture of all those engaging qualities in bed with a rake at a bagnio, smoaking tobacco, drinking punch, talking obscenity, and swearing and cursing with all the impudence and impiety of the lowest and most abandoned trull of a soldier. "I assure you," answered she, "I did all I could to prevent you; and yet I almost hated you for not seeing through what I strove to hide. Why, Mr. Booth, was you not more quick-sighted?--I will answer for you--your affections were more happily disposed of to a much better woman than myself, whom you married soon afterwards. I should ask you for her, Mr. Booth; I should have asked you for her before; but I am unworthy of asking for her, or of calling her my acquaintance." She then renewed her discourse as follows: "You know, Mr. Booth, I soon afterwards left that town, upon the death of my grandmother, and returned home to my father's house; where I had not been long arrived before some troops of dragoons came to quarter in our neighbourhood. Among the officers there was a cornet whose detested name was Hebbers, a name I could scarce repeat, had I not at the same time the pleasure to reflect that he is now no more. My father, you know, who is a hearty well-wisher to the present government, used always to invite the officers to his house; so did he these. Nor was it long before this cornet in so particular a manner recommended himself to the poor old gentleman (I cannot think of him without tears), that our house became his principal habitation, and he was rarely at his quarters, unless when his superior officers obliged him to be there. I shall say nothing of his person, nor could that be any recommendation to a man; it was such, however, as no woman could have made an objection to. Nature had certainly wrapt up her odious work in a most beautiful covering. To say the truth, he was the handsomest man, except one only, that I ever saw--I assure you, I have seen a handsomer---but-- well.--He had, besides, all the qualifications of a gentleman; was genteel and extremely polite; spoke French well, and danced to a miracle; but what chiefly recommended him to my father was his skill in music, of which you know that dear man was the most violent lover. I wish he was not too susceptible of flattery on that head; for I have heard Hebbers often greatly commend my father's performance, and have observed that the good man was wonderfully pleased with such commendations. To say the truth, it is the only way I can account for the extraordinary friendship which my father conceived for this person; such a friendship, that he at last became a part of our family. "No woman can bear any superiority in whatever thing she desires to excel in. I now began to hate all the admirers of my sister, to be uneasy at every commendation bestowed on her skill in music, and consequently to love Hebbers for the preference which he gave to mine.